Two different boxes of Hornady factory ammo. Shot 3 out of each box at 100 yards (Bi-Pod and rear field bag). 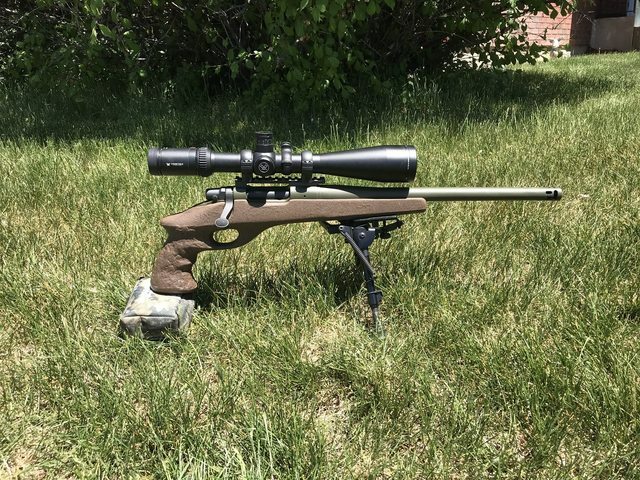 223 Remington Rear-Grip XP-100 with a 1-8 twist 15" Hart barrel. Grabbed some more of the 75 grain HPBT, and did some doggin out to 465 yards. So close at 605 yards... Definitely had some wind to contend with. Guessed MV, and then shot at a steel pd at 500 yards, and then began to adjust my MV on my ballistic app. Missed the steel pd at 1115 yards, but got close. Fun day. This will be one of the loaner XP's for WY-SHOT. Seriously, good shootin' as is expected of you. I just never expected two different boxes of factory ammo to shoot so good. The stock was incredibly modified before I got it, I think to make weight for silhouette shooting. I then had the grip lengthened, and it ended up being too long. Then, I had the forend rounded and the grip shortened to be functional for field shooting. Also had brake added. I have a question regarding optics on specialty handguns. You are shooting way out there and to be able to see the target and call your shots you need some pretty big glass. 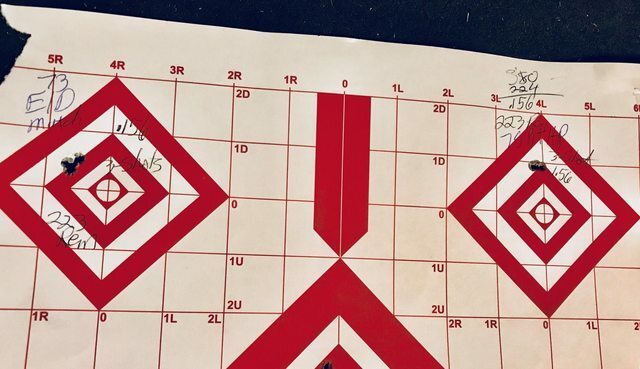 How are you equipping your handguns to see and make 1100+ yard shots? Are you using rifle optics and just adjusting your hold and head position to see through the scope? I'm asking because I'd like to put together a "long-range" 223 of some flavor in the future. But after a day at a range with steel hanging to 1500 yards and using big glass on rifles, I'm trying to figure out how to make it happen on a handgun. I use medium to high quality scopes that are set-up for distance. Good muzzle brakes are important as well. Actually, it is easier to spot your own shots further out than say 200 yards-Again it depends on the set-up. It is always good to have someone spotting for you. It is extremely difficult to find the form factor of a bullet without careful calculations. However if the type of bullet is know then the form factor can be looked up in the following table. Generated in 0.042 seconds in which 0.011 seconds were spent on a total of 15 queries. Zlib compression enabled.